Denver weather has a way of changing every 15 minutes, but almost every summer, rainfall totals and water conservation become the focus of the community. While maintaining your yard and keeping the space looking as nice as possible is always a priority, it can be difficult to accomplish during periods of extended drought conditions. Working with your trusted Denver sprinkler service will help you get the most out of your lawn and your watering routine even when the county imposes restrictions. Here’s what you need to know about getting the most out of your sprinkler system during a summer drought. Technically, droughts are any period of time where rainfall is scarce and conditions in the area are drier than normal. These events can be short, lasting for as little as a month or can extend well over a year, impacting growth throughout spring, summer, and fall. Even though the average rainfall in Colorado is relatively low, averaging around 17 inches a year, snowmelt often provides the greater Denver area with plenty of water to keep yards and landscaping looking lush and vibrant throughout the warmer part of the year. When snow is scarce, it puts the state at risk for water shortages and increases the chances of wildfires damaging the surrounding wilderness. What this often means for homeowners is an increased awareness of water usage and heightened conservation efforts across the county. While Denver county is slow to put water restrictions in place, they can occasionally institute watering regulations that impact your regular sprinkler system’s operation. Depending on the severity of the drought, the county will institute either voluntary or mandatory water use restrictions. If voluntary restrictions are in place, it’s up to the individual homeowner to decide how and if they want to conserve water. Mandatory restrictions are put in place when the government declares a Stage 2 drought or higher. These mandatory restrictions will require you to shut off your sprinkler system and prevents homeowners from watering their lawns or landscaping until the drought conditions lessen. Though severe droughts do happen, they’re far more infrequent than moderate droughts. Regardless of the type of restrictions in place, every conservation effort homeowners can make will help reduce the impact the drought has on the water table. During voluntary restrictions, there are many simple things you can do to reduce the amount of water your household uses, particularly with your landscaping and your sprinkler system. Water during the coolest part of the day. Water evaporates in heat and direct sunshine. This means if you water during the middle of the day, your plants will require more water to adequately hydrate the root systems. Instead, run your sprinklers during the early morning or after dusk when the weather has cooled off and the sun is lower in the sky. This way, your plants will get the water they need without forcing your sprinklers to use more water than necessary. Angle the sprinklers appropriately. Watering your driveway or the side of your home won’t help your lawn maintain its growth. When you turn your sprinklers on, watch to see where the water goes. If it’s hitting the majority of your plants, you’ll be fine. However, if the water is hitting the pavement, schedule an appointment with your sprinkler service and let them reposition the sprinkler heads so the spray will do the most good. It’s best to avoid trying to do this yourself as you may inadvertently damage the system. Look for overly green areas in your yard. Overwatering is something everyone should avoid, but it’s even more of a hazard during drought conditions. Periodically check your yard for any overly green areas or places where the lawn is growing faster than others. This could indicate a leak in your system that needs to be addressed immediately. The faster the leak is repaired, the more water your household will be able to conserve. Set timers. If you’re watering early in the morning or late in the evening, it’s easy to forget to water your lawn until later in the day. Rather than dealing with the evaporation issue, set your sprinklers on a timer and take the worry out of watering. Don’t water every day. Though it may seem like a good idea to water your yard a little each day, it’s not necessary, especially during drought conditions where water levels are low. Instead, water your plants and your lawn every three days. This will prevent the risk of overwatering the lawn while also helping you conserve water at home. During mandatory restrictions, you’ll need to adhere to the requirements outlined by the county. If they permit you to run your sprinklers for a few minutes every few days, do so. This will help keep your sprinklers in good condition, even if the water is not enough to adequately help your plants. If restrictions are severe, don’t simply turn off your sprinkler system. Contact your technician and have them properly prepare the system for premature shutdown. This will help keep your irrigation system in good repair, ensuring that they’re ready for the following year when the rainfall and snowmelt levels are back to normal. Regardless of the restrictions, you’ll want to take the time to water your trees, even if you have to do it by hand. Letting your trees face the drought without a little bit of water every few days can cause their vascular system to wither, leading the tree to die during the drought. 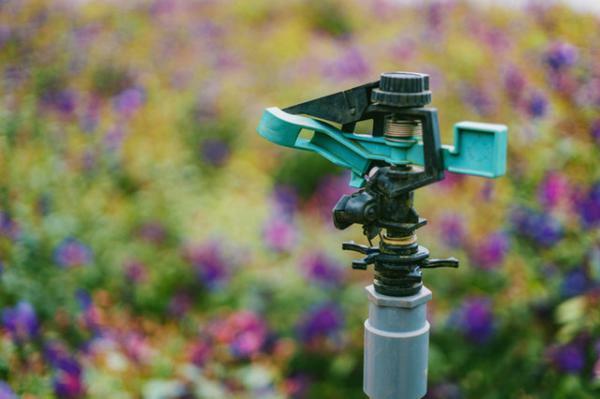 Whether you’re looking for a way to streamline your watering routine or simply want an expert to get your sprinklers ready for the growing season, contact the pros at Water Solutions. Our friendly and dedicated staff will help you with everything from installation to ongoing maintenance and will work to keep your landscaping looking its best by providing reliable and efficient watering systems for your yard. Call (720) 435-1495 to schedule an appointment with our friendly team and get a free estimate for all work and repairs.